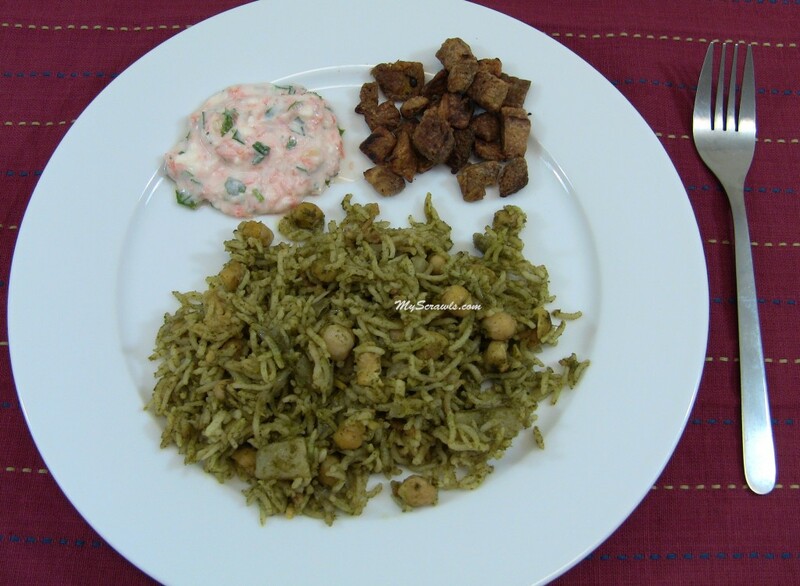 Pudina pulav is a staple single pot meal at our home. 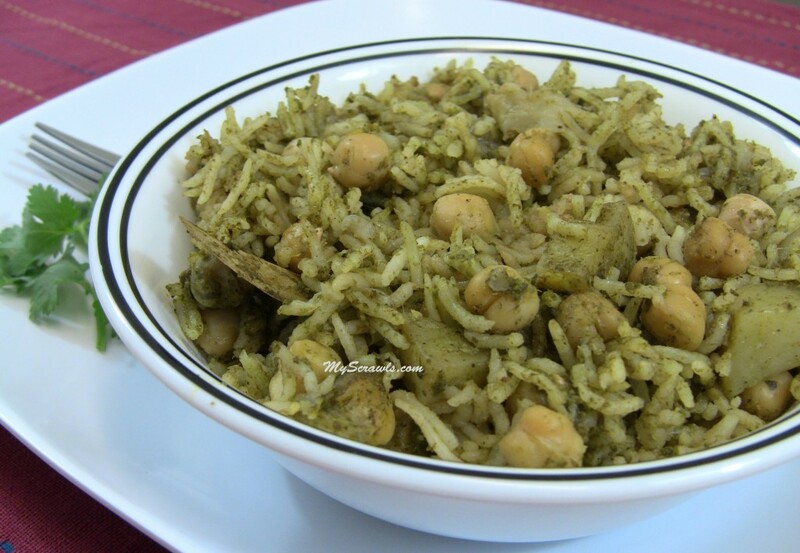 I have already posted pudina chana pulav recipe around 2 years back. 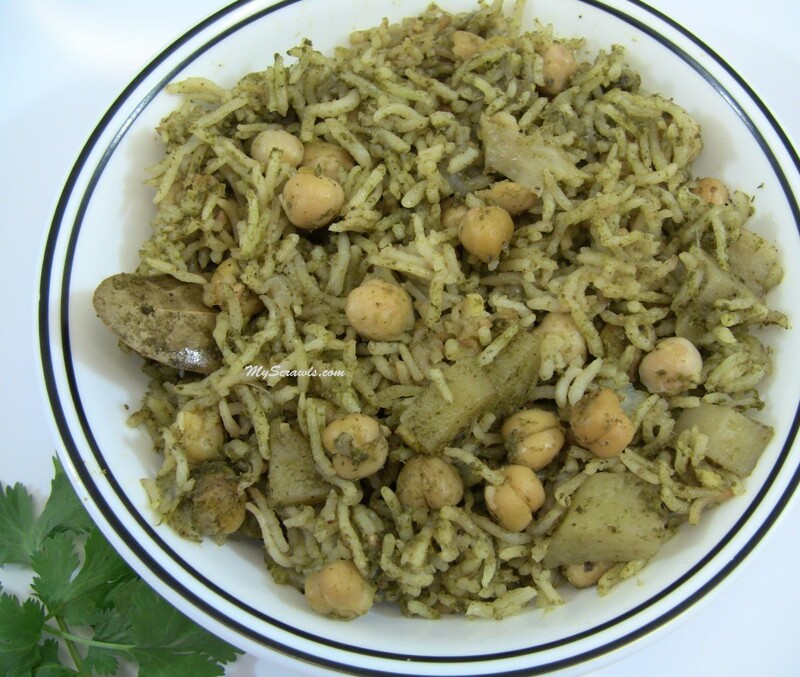 Am revisiting the recipe:) The new version of pudina pulao has few extra ingredients than old recipe. Nevertheless both versions taste gud! Soak chana (chickpeas) in water overnight or at least 6-8 hrs. Drain water and use the soaked chana in the recipe. You need not pressure cook it prior to adding it in the pulao. If you use the canned chickpeas, throw the water, rinse it and use. I have used 1.5 cups of water for 1 cup of basmati rice. In case you use different variety of rice, change the amount of water accordingly. Chop onion and potatoes and keep it aside. Wash and clean mint leaves and cilantro. Grind mint leaves and cilantro together with ginger, garlic, cloves, cinnamon, pepper, cumin seeds, green chillies and coconut. Add water as required and make a smooth paste. Drain water from the rice and keep it aside. Meanwhile heat oil and sauté onion till transparent. Toss potatoes and fry for 3-4 minutes. Add the ground masala (mint paste), hing and salt and keep stirring for 2 minutes. Mix rice and fry for 3-4 minutes in low flame. Add chana and bay leaf and mix well. Add 1.5 cups of water and pressure cook for 2-3 whistles.